Arsenal star Alexis Sanchez has reassured his fans that his ankle is much better, despite what the images he shared on social media would suggest. Having suffered the injury during Chile’s Copa America final clash with Argentina last month, there were fears that he could be set for an extended period on the sidelines. 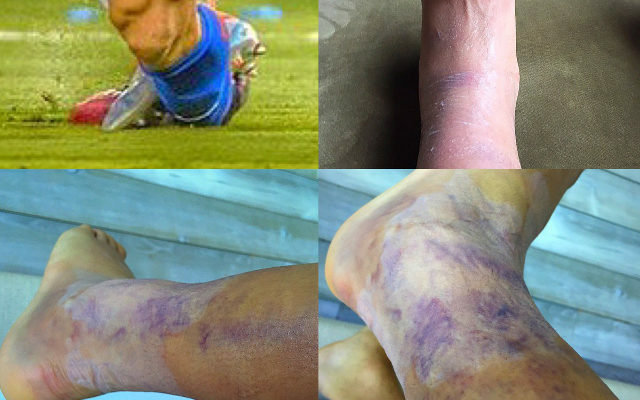 Based on the images below, which show just how badly bruised and swollen his ankle is, the Chilean international remained positive that he is on the mend and doesn’t fear being out for long. “Fourth day of my vacation, locked up in the hotel bored hahaha…. But I’m already much better. Your body can endure almost everything…it is your mind that you have to convince,” he wrote as a caption. Gunners boss Arsene Wenger would certainly have been a concerned man after seeing the challenge, with Arsenal’s pre-season plans getting underway in the USA and Scandinavia later this month. Coupled with the fact that Sanchez struggled with injury setbacks last season, the last thing that the French tactician wants at this stage to have him miss the start of the new campaign with so much at stake for the club. Sanchez will hope to be fully fit in time to feature in pre-season without any issues, and he will undoubtedly also hope to play an influential role in Arsenal’s push for success next season despite transfer speculation linking him with a move to Juventus.